Scrambling your eggs fast is what I thought was the best way to make a great scrambled egg. I mean, I see them do this in diners and they do it so fast. I have to tell you, that’s not the right way to make fluffy scrambled eggs. Low and slow is how you want to scramble your eggs. I don’t know much about the science that makes this true but I can tell you that the proteins in the eggs seem to love a slower process when being scrambled. After you try my method I think you’ll agree, that cooking eggs the right way makes a huge difference in the texture and taste of your eggs. Let’s step back a little, what’s my favorite meal of the day? That’s easy its breakfast. I love having all my favorite breakfast ingredients either in a Frittata or even casserole style where everything is layered. Then I thought, how about in a large glass stemmed trifle bowl where I could just stare in amazement at its colorful beauty. My Breakfast Trifle is the answer. 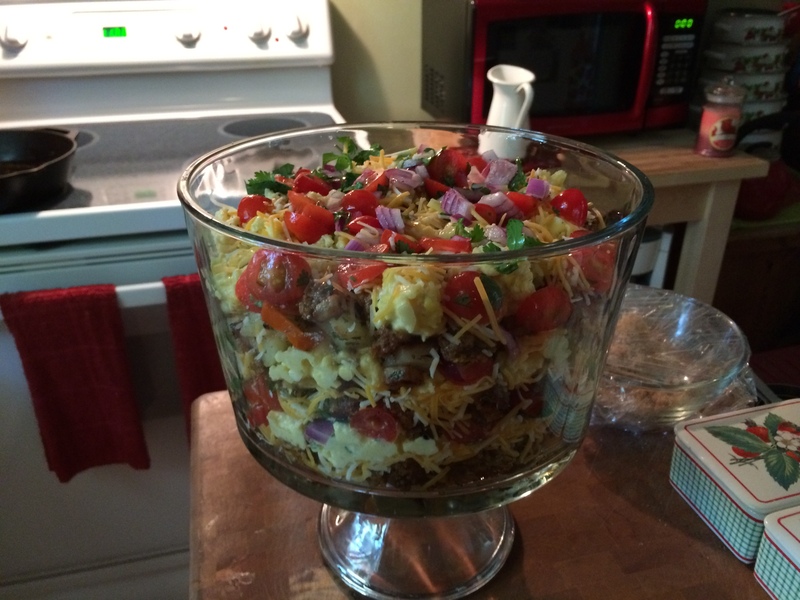 I wanted to bring a few of my recipes together to make this Breakfast Trifle. One is my Homestyle Fried Potatoes, second is my Perfect Scrambled Eggs and third my Pico de Gallo. I’m combining three of my recipes to go along with the flavors of a Tex-Mex style turkey sausage seasoned with my Fajita Spice Blend. The bold flavors of these spices compliment the other ingredients perfectly. I’ve posted all the ingredients below you’ll need to make this Breakfast Trifle. I’ve also attached links for complete directions to each recipe. I just love sweet bell peppers mixed in with my potatoes. At this point, the potatoes with sweet peppers are done. Moving on to the scrambled eggs. For my scrambled egg recipe just click on the link at the bottom of this post. Today I picked a Colby Jack cheese for this dish. 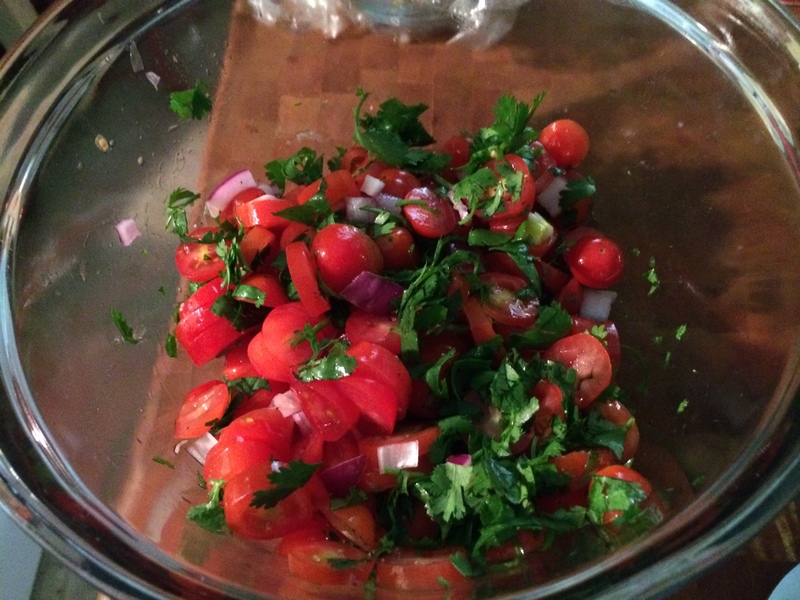 Tip: Make the Pico de Gallo first, place into a bowl, cover, then transfer to the frig to chill. A Great Tip: Have all the vegetables prepped and the spices measured out (refer to the pictures) and set on a plate before beginning these recipes. Setting yourself up before you begin makes a BIG difference. Brown the turkey sausage and cook the potatoes at the same time. In Cast Iron skillet on medium-high heat, add 2 tablespoons of olive oil. Add the ground turkey sausage. Start breaking up the sausage with the back of a wooden spoon. Add Kosher salt, freshly ground black pepper, and fajita seasoning blend, stir to combine. 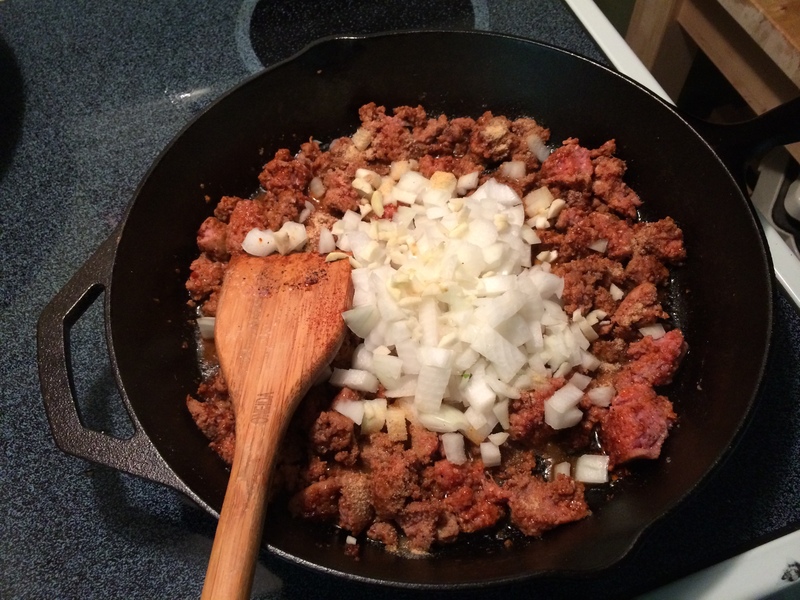 As the turkey sausage starts to brown, add the diced onions and minced garlic. Continue stirring and cooking the sausage and onion mixture. Once the sausage is completely browned and onions are nicely caramelized about 15-20 minutes, (internal temperature is 165-degrees F.) then add 1/4 cup of unsalted chicken broth to deglaze the pan. Use the back of a wooden spoon to scrape up the bits from the bottom of the pan and allow the liquid to completely evaporate another 5 minutes. 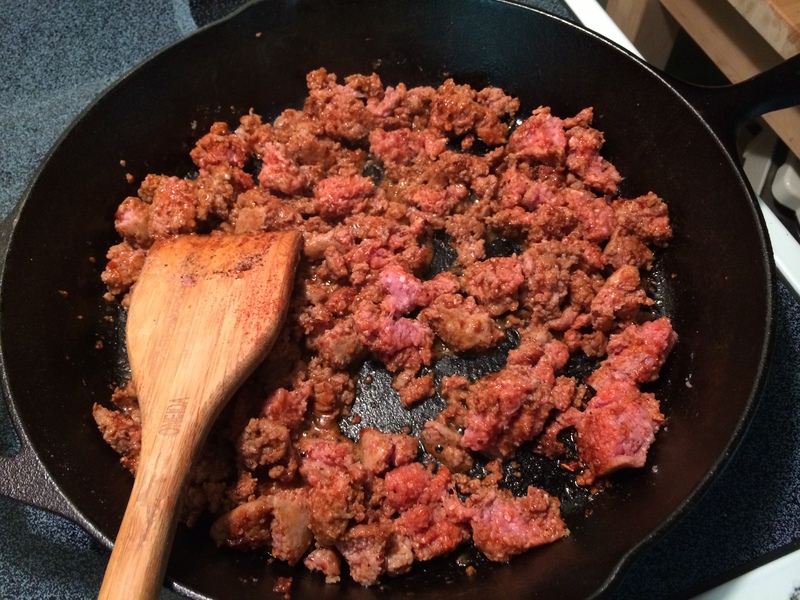 Using a slotted spoon transfer the turkey sausage to a bowl, cover and set aside. Follow the directions from the link below for cooking the potatoes. Once the potatoes are done transfer them to a bowl and set aside. Note: Times and heat may vary slightly on different stovetops, keep a close eye on the potatoes so they don’t burn. In a large mixing bowl, whisk together the ingredients for the scrambled eggs. Use the same sautépan the potatoes were cooked in. 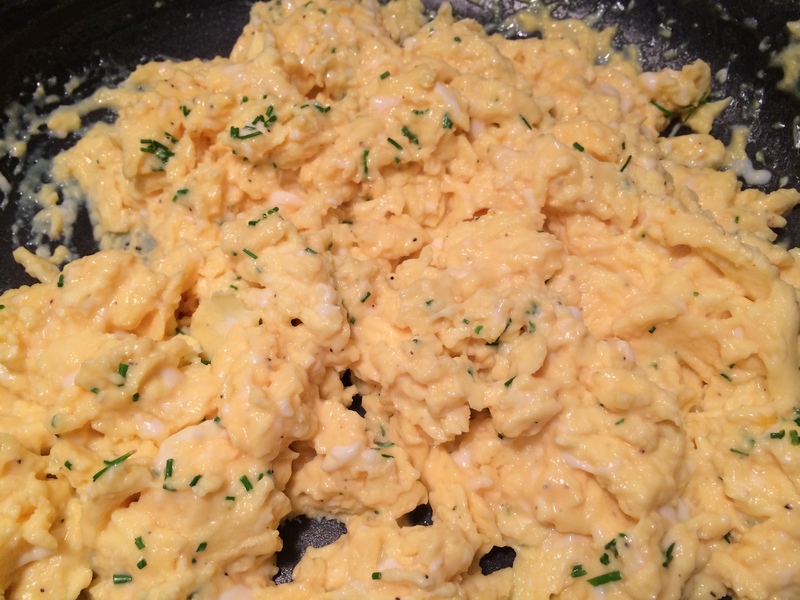 Follow the directions from the link below for making the scrambled eggs. Once the scrambled eggs are ready, it’s time to assemble this dish. The first layer, start with turkey sausage, then the cheese, next, the eggs, the potatoes with the sweet peppers, and finally the Pico de Gallo. Repeat this process until the bowl is full. This dish is great for entertaining. A perfect centerpiece for your next brunch.